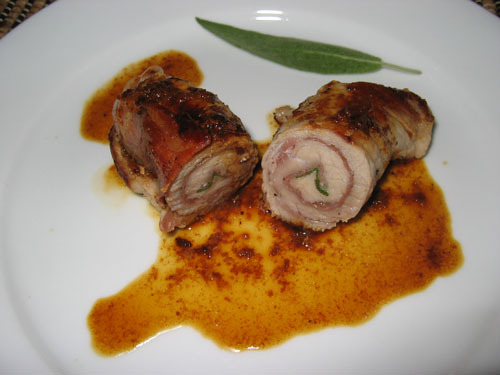 Recently I have been seeing “Saltimbocca alla Romana” come up in a few places and I wanted to try it. It looked pretty simple, in fact, looking at the recipe I was a little worried that it would be a little plain. I was pleasantly surprised by the amount of flavour. The sage flavour infused the veal and the sauce from deglazing the pan was full of flavour. I can see why this dish is called “hop in the mouth”. This dish shows off the sage really nicely. Take a look at the Weekend Herb Blogging roundup at Küchenlatein. Kevin, you’re on a roll. This dish looks very appetizing, not too hard and a something to offer for guests. This looks delicious. I’ve only had this dish in restaurants, but I do love sage. Wish I could send you and Katie both some of my sage, I have tons and tons of it. Saltimbocca is one of my favorites and it has been too long since I’ve had it. Yours looks delicious. I need to remember to pick up some veal the next time I go to the butcher! Looks excellent Kevin. Easy to prepare and delicious at the same time. You’ve got it made!! This looks very good! I’m putting it on my Menu Planner for next week…. You sure do eat well!! This looks fantastic! This looks so elegant and delicious, Kevin. I rarely use sage, so this will be a good way to use it. This looks like a great dish for a dinner party. Ilove anything with prosciutto. Great job! I’ve never seen it in a roll like that. Ours is flat. Looks yummy. Wow! That turned out great looking! I have not heard of Saltimbocca . Yes, I always add cheese to the top of my spaghetti bolognese. Usually a mix of Cheddar and Mozzarella. Then I grill it. It’s nicer than parmesan, I think. I made it for Chef (Hubby)tonight. He thinks it would have been tastier without the sage leaf. He thought the presentation(which I tried to copy from here) was spot on! This looks amazing! This is usually what I order when I go out to Italian restaurants! I’ll have to make this soon.